in the Perth suburb of Subiaco, was Western Australia’s first dedicated children’s hospital before PCH replaced the 108-year-old facility in 2018. PMH has a special place in the State's heart and history through the exceptional care and services provided to patients and their families, as well as being at the forefront of many medical breakthroughs. The history of PMH dates back to 1897, when Perth businessman Charles Moore received threepence from a young girl, who asked for it to be put towards a children’s hospital. After 12 years of fundraising and lobbying efforts, the girl’s wish came true in 1909 when Perth’s Children’s Hospital opened to the public. The original facilities included 40 beds, an operating theatre and outpatient department. 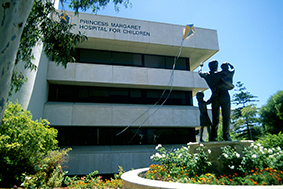 It was renamed PMH in 1949, after Princess Margaret, the sister of Queen Elizabeth II. Although PMH underwent many renovations and improvements over the years, Western Australia’s rapidly growing and changing population meant more room was needed. In 2008, it was announced that a new, purpose-built children's hospital would be constructed to better address the community's future paediatric health needs. At the time of its closure in June 2018, PMH had approximately 220 beds and served more than 280,000 patients per year. What will happen to the PMH site? After PMH’s final patients transferred to PCH on 10 June 2018, the Department of Health began a clinical decommissioning process, which is expected to take approximately 14 weeks. Responsibility for the site will then transfer to the Minister for Lands. LandCorp and the Metropolitan Redevelopment Authority are developing plans for the ‘Subi East’ precinct (external site), which includes the PMH site and other nearby landmarks such as Subiaco Oval. Some parts of the PMH site – Godfrey House and the multi-faith building – have heritage significance and will be kept in place.